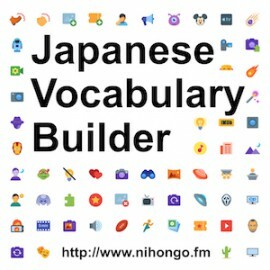 Each Japanese Vocabulary Builder audio study segment contains between 18 to 30 vocabulary words and average between 4 - 6 minutes. The target english word is spoken once by native English speaker, followed by native Japanese speaker who correctly pronounces the Japanese version of word twice. Listen, repeat & learn with nihongo.fm's low cost study segments. Several shortened study segment samples are broadcast 24/7 on the nihongo.fm website.